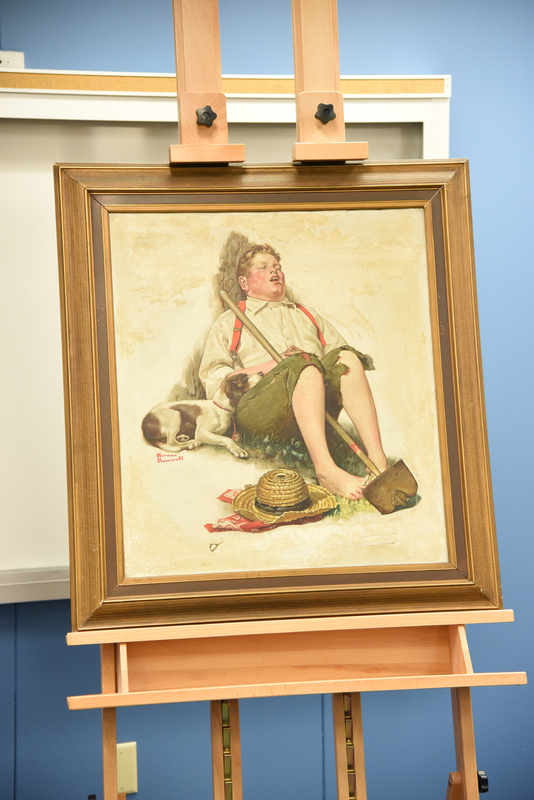 PHILADELPHIA — More than 40 years after the theft of Norman Rockwell’s “Boy Asleep with Hoe” — also known as “Lazy Bones” or “Taking a Break” — the painting has been returned to the family of its original owners following a March 31 ceremony with Chubb and the FBI in Philadelphia. Stolen from the Grant family’s Cherry Hill, N.J., home in 1976, the family submitted a claim to Chubb, their insurance provider at the time. Upon claim payment, Chubb acquired the painting’s title. “The theft of ‘Boy Asleep with Hoe’ remained one of the art world’s greatest mysteries for over four decades. In partnership with the FBI, we’re pleased to return it to the Grant family,” said Fran O’Brien, Senior Vice President, Chubb Group, Division President, North America Personal Risk Services. John was a child when the painting was stolen. His father, the late Robert Grant, had acquired the painting in 1952 after accidentally putting a hole through it with an errant cue stick while shooting pool and being told, “You just bought yourself a painting,” according to John. The accident proved serendipitous as it made it easy to ID the painting as their painting, John said. “I’d been looking for it for 11 years” and was introduced to a retired FBI agent who investigated art crimes and he assisted John in his search and eventually navigating the recovery process that began in November when Grant got the call that the painting had been located. It was not until the press conference though four months later that John was able to see the painting again in person. “It’s surreal, it’s a miracle,” John said. According to recent news stories, the value of the recovered painting is estimated to be between $600,000 to $1,000,000, which is significantly more than its value at the time of the theft. John Grant said he and the family had not decided what they would be doing with the painting. “Recovered art is often valued at a greater amount than a similar piece, given its unique provenance. While many often assume a piece is out of harm’s way upon recovery, its newfound high-profile status and value can invite new exposures,” O’Brien said. The Grant family returned the 1970s claims payment to Chubb in exchange for the painting. Chubb will donate the funds to Norman Rockwell Museum in Stockbridge, Mass. 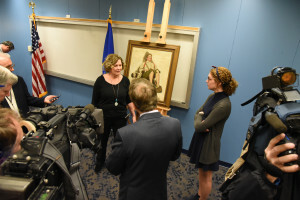 At a press conference in Philadelphia March 31, the Norman Rockwell painting was officially returned to the Grant family. Photo courtesy Chubb.